Do you still need a Halloween costume? We’ve got you covered with this creepy outfit. Are you actually the spirit of a fallen soldier, supernaturally animating the broken and battered armor you died in? Quick—join the party while everyone’s distracted. You should always be prepared to seize opportunities as they come. For example, you and your friends may someday defeat a nest full of giant spiders. Should one of your companions quip, “At least spiders can’t fly,” you’ll want to have this disturbing glider on hand and a nice shadowy ledge to descend from. Get the Haunted Armor Outfit and the Arachnid Glider in one package for the ultimate scare! 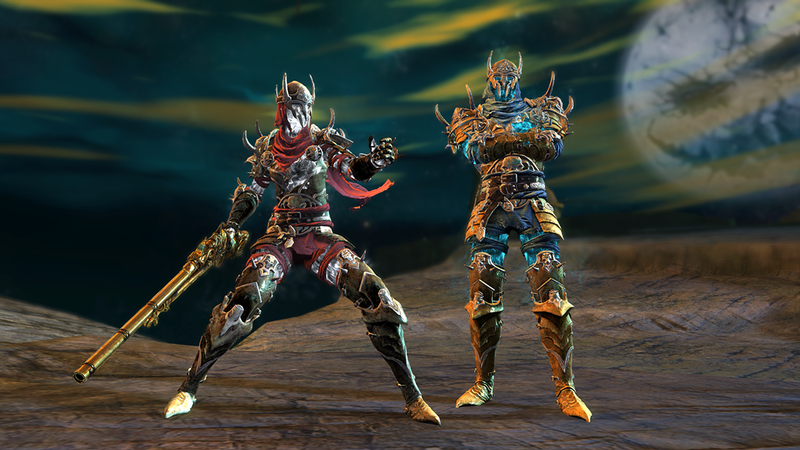 It also contains an Onyx and Gold Lion Weapon Choice, a Total Makeover Kit, and five Elonian Beasts Dye Kits. We’re refreshing our seasonal backpack inventory this week. Visit the Gem Store to grab our summer stock before it’s gone, and keep an eye out for returning favorites. Treat yourself to all the fun and features of the Guild Wars 2 expansions! Guild Wars 2: Heart of Thorns™ and Guild Wars 2: Path of Fire™ digital deluxe upgrades will be 50% off in the Gem Store from November 2 through November 8. Team ArenaNet is livestreaming 24 hours of Guild Wars 2 gameplay for Extra Life this weekend. Learn all about it here, and stop by the Gem Store on November 2 for a free Revive Orb.